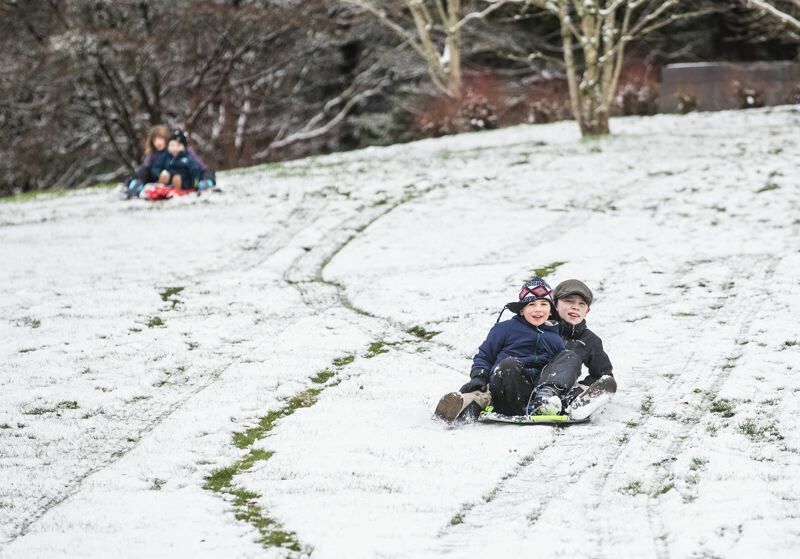 Children take advantage of a snow day as thaw spreads across the Portland region. 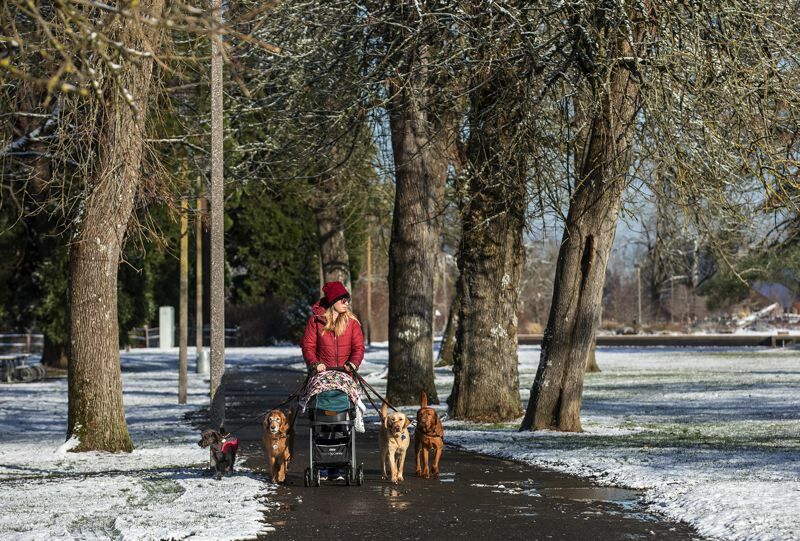 UPDATE: The sun is out — and road conditions may improve. 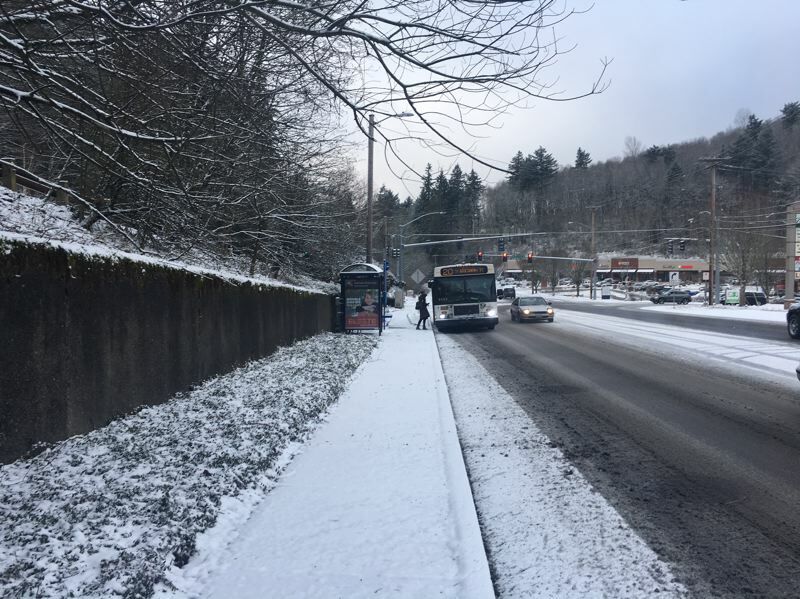 TriMet reports that most of its 83 bus lines are now running regular routes, but two lines remain temporarily canceled: 63 and 82. Service will be restored when weather conditions improve, according to a transit spokeswoman. "We thank our riders for their patience as we safely get them to their destinations," she wrote. "We continue to urge riders to use caution heading to and from stops and stations as sidewalks and streets may be slick." Many buses are running with chained tires, which limits their speed. MAX lines are reportedly running on schedule, while WES train service was unaffected by the weather. LIFT paratransit is providing reduced service for medical trips. Local tow companies are reporting waits of up to four hours — a good incentive for locals to stay put at home if possible. • An injury crash was reported near Northeast 148th Avenue at Couch Street after a car crashed into a parked car. 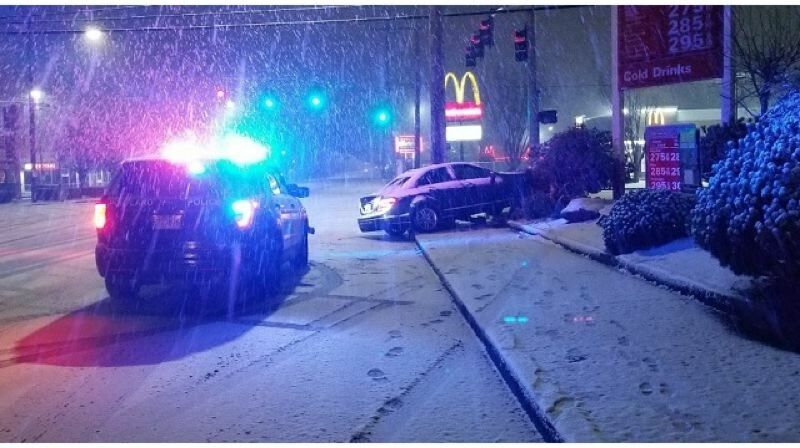 • A non-injury crash was reported near Southeast Stark and 135th Avenue after a driver turned "too fast for conditions" and skidded into a street sign. • A non-injury crash on Northeast Glisan Street at 122nd Avenue occurred after a motorist moving too fast skidded while trying to brake for a red light. • Northeast Sandy Boulevard near 156th Avenue was closed but is now open after a hit-and-run driver "sheared off" a power pole. • Another non-injury crash was reported on the Interstate 205 frontage road between Southeast Stark and Glisan streets. An SUV hit a barrier but the driver was able to continue piloting the vehicle. 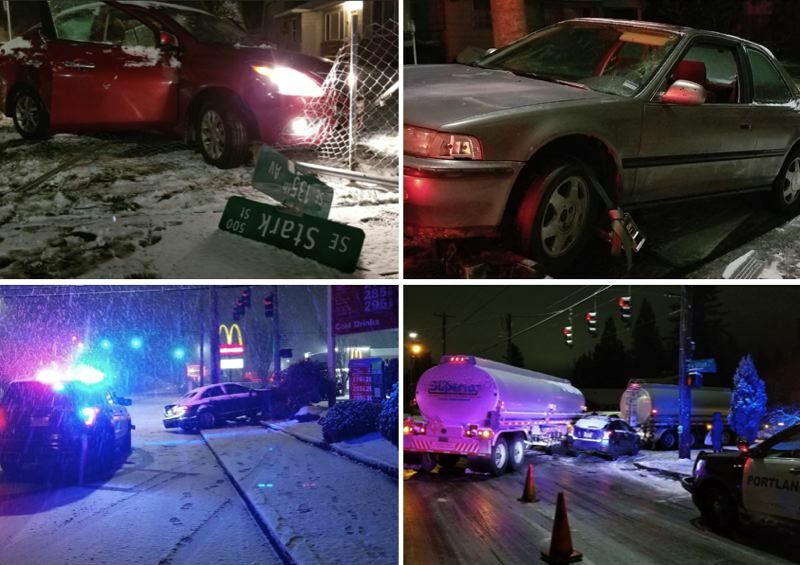 • Police responded to a non-injury crash between a truck loaded with 8,000 gallons of fuel and a sedan at Northeast 148th Avenue and Glisan Street. Authorities said no fire or fuels leaks occurred. A tow was ordered. • A roll-over crash occurred on Southbound I-205 at Southeast Foster Road. Another crash involving two cars on Foster was reported between Southeast Jenne Road and Barbara Welch. No injuries were noted. • Another crash came in at Northeast 122nd Avenue over Interstate 84. • Two more non-injury crashes happened at Southeast Division at 126th Avenue and on Southeast Foster Road at 158th Avenue. • Police said a $440 ticket was coming for a driver at Grant High School who was reportedly "spinning doughnuts in the lot and on the field." 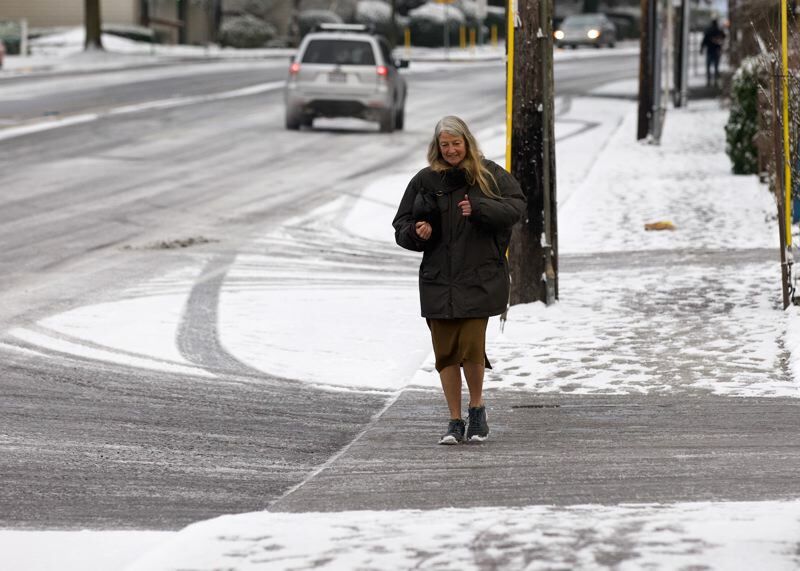 "On the super icy streets, if you have to stop for red light, stop sign, etc, let your car idle forward a bit before easing on the gas when it's time to go," police wrote. "Also, double or triple your stopping distances!" 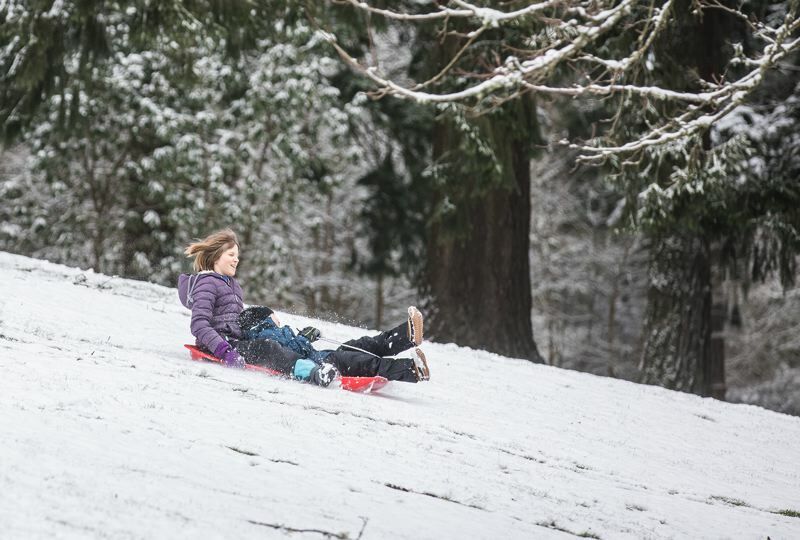 School districts in the region, including Portland Public Schools, closed Tuesday, Feb. 5, because of about an inch of snow that fell over night on the region. 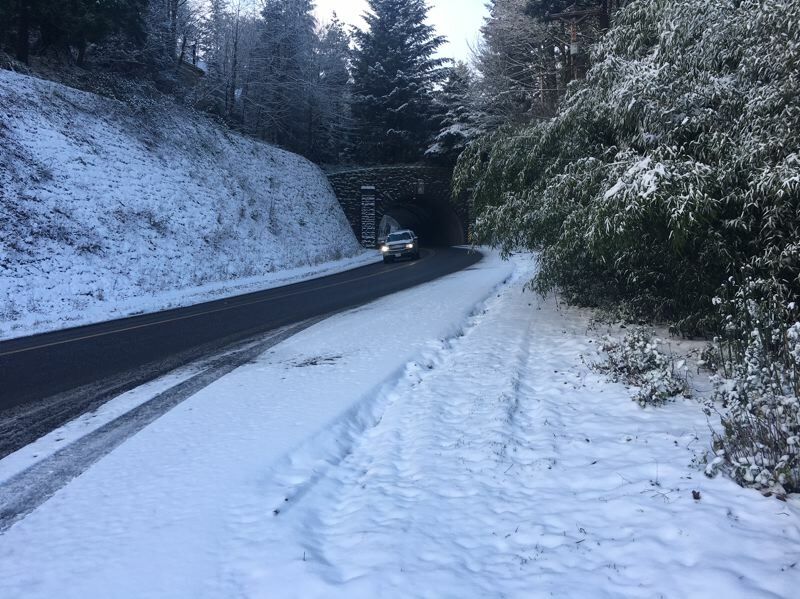 The first snow of the winter also triggered late-night crashes and complicated Tuesday morning's commute. 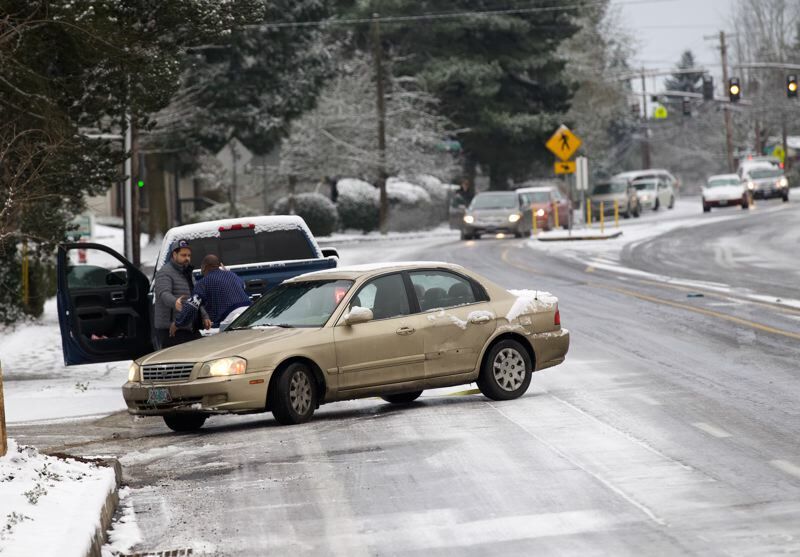 Portland police said the Northeast Halsey Street overpass at Interstate 84 and Interstate 205 was slick with ice. Several cars crashed there just before 11 p.m. Feb. 4. Northeast 102nd Avenue over I-84 was also icy in the Parkrose area, police said. No injuries were reported in the early morning crashes. 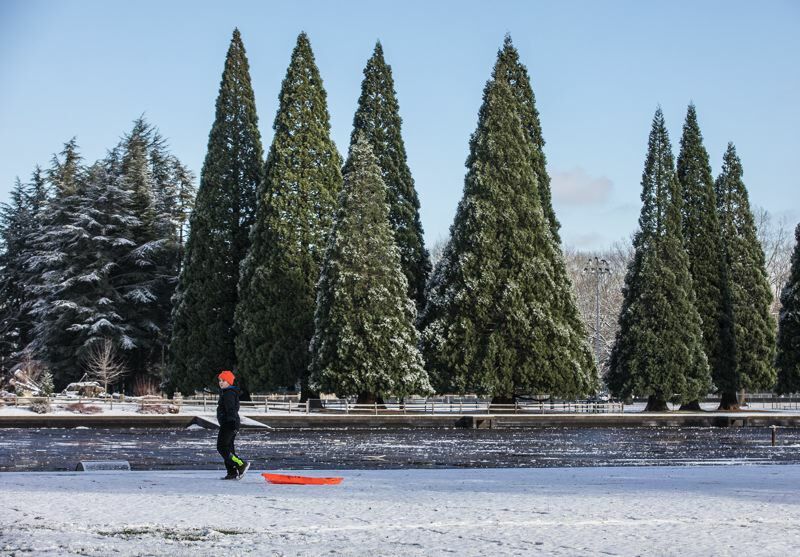 School districts across Northwest Oregon and Southwest Washington closed on Tuesday. Others were on two-hour delays. You can check out the latest information on closures and delays here.